BMW put on a show for the fans in the first session, putting Robert Kubica on the soft tires and sending him out for a quick lap. He finished the session fastest but the Ferraris were not far behind, the McLarens next up and all of them within a quarter of a second of each other. The Hondas looked out of place in eighth and ninth spots, almost certain to slip down the order in the second session, but Rosberg's seventh seemed a more accurate reflection of current form. Inevitably, our next port of call was Vettel; is he showing well in the Toro Rosso? The answer is yes, he was marginally quicker than Liuzzi and both were not far behind Coulthard in the Red Bull. Webber had reliability problems and was unable to set a representative time in the fourth Newey design. It was the second session that gave a more expected reflection of how things stand, however. There were two surprises, Kovalainen's pace in the Renault netting him second spot, and the Ferraris managing only sixth and seventh fastest. No doubt Raikkonen and Massa will be quicker when it counts, but Heikki's time is surely an indication that Renault are right to be optimistic about their improvements to the car. 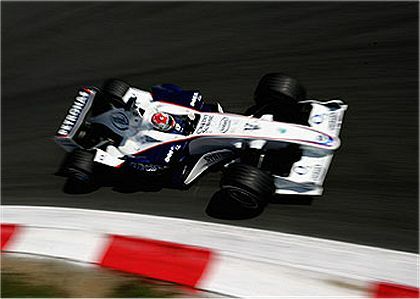 Nico Rosberg continued to be the fly in everyone's ointment, hauling the Williams up to fourth, but his team mate was unable to keep pace and ended up twelfth. The rest were more or less where you'd expect, the Hondas back to their struggle with their second team, Super Aguri (an excellent run from Davidson put him at the head of this bunch), and Liuzzi managed to be a fraction quicker than Vettel this time out. It was an excellent showing from the young German for his first day in the car, however, and he is bound to get quicker as he settles in. Look out, Tonio. If Kovalainen and Rosberg can maintain their speed tomorrow, we could be in for a fascinating battle in qualifying. I'm sure the usual suspects will be in the hunt for pole, with probably McLaren having a slight edge on Ferrari, but interlopers into their private battle might grab one of those top four grid positions. Certainly, Heidfeld, Kubica, Rosberg and Kovalainen look to have the pace to do that, Quick Nick perhaps being the best bet. Fisichella? Well, he seems to be falling behind Heikki of late and I think he will struggle to beat him this time round.